Find and book Chinatown bus Philadelphia cheap bus tickets online and compare bus operators, prices, and bus schedules to find the best deal for your bus travel needs. Philadelphia is the largest city in Pennsylvania. It has the most outdoor sculptures in America, and Fairmount Park is the largest landscaped urban park in the world. 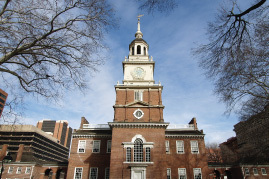 Popular sightseeing includes Liberty Bell, Independence Hall, Philadelphia Museum of Art, and more. Find USA Chinatown East Coast bus tickets from Syracuse, New York to Philadelphia, Philadelphia to Boston, Harrisburg, Washington DC to Philadelphia, State College, Clarion to Philadelphia, Baltimore to Philadelphia, Atlanta, Charlotte, Midwest, Arlington, Virginia, Rochester, Newport News, York, Wilmington, Maryland, Bethesda, Atlantic City, Norfolk, Richmond, Woodbury Outlets and more. Enjoy a bus trip to the most popular cities and destinations from Philadelphia, PA.